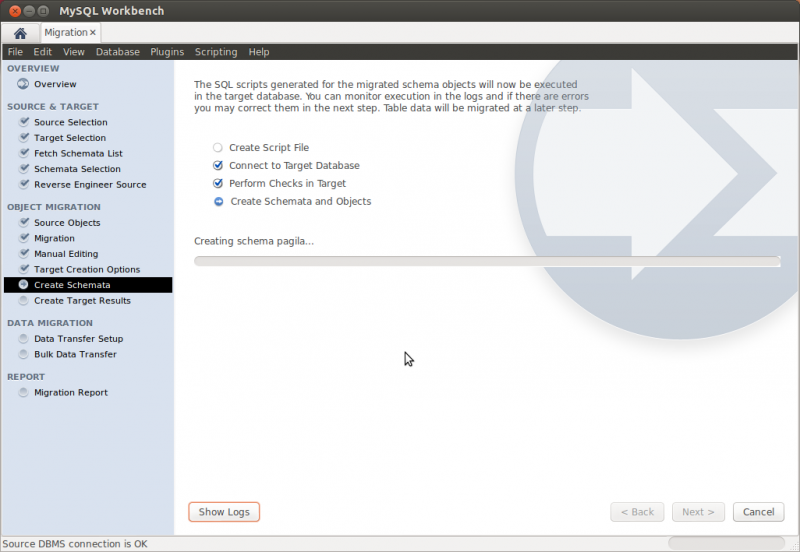 Additionally, you can use the Migration Wizard to perform MySQL to MySQL database migrations, which can be used for tasks such as copying a database across servers or migrating data across different versions of MySQL. 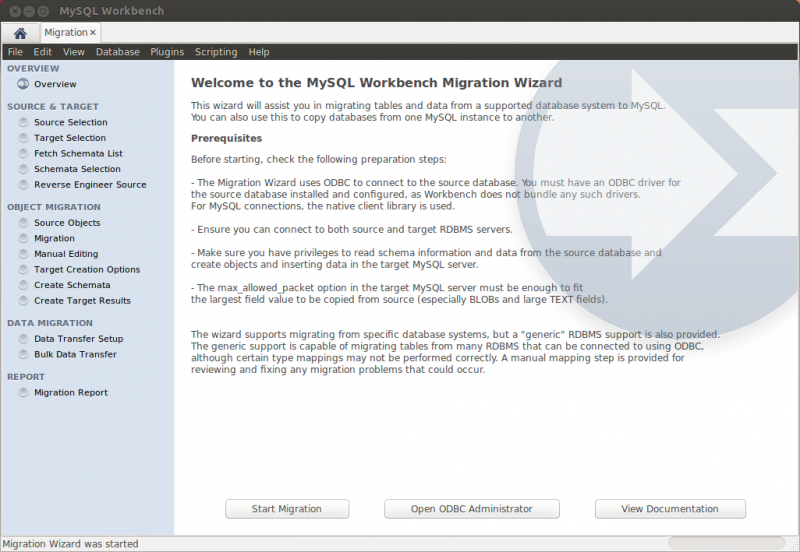 We have already described in a previous post how to use the Migration Wizard to migrate a Microsoft SQL Server database to MySQL. 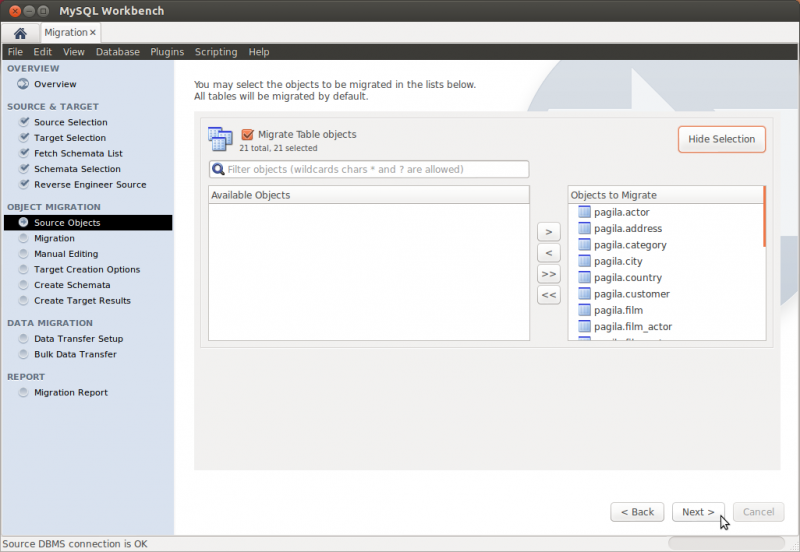 In this post we are going to migrate a PostgreSQL database to MySQL using the Migration Wizard. A running PostgreSQL instance in which you have proper access to the database you want to migrate. (I’ll call this database from now on the source database). I have a PostgreSQL instance running in a computer (an Ubuntu 12.04 box) in my local network. I have installed on top of it the Pagila Sample Database from pgFoundry. I’m using the standard postgres user, which has full privileges. You can use whatever PostgreSQL version you have at hand, but keep in mind that the Migration Wizard officially supports PostgreSQL 8.0 and newer so older PostgreSQL versions might not work. A running MySQL Server instance with proper user access. 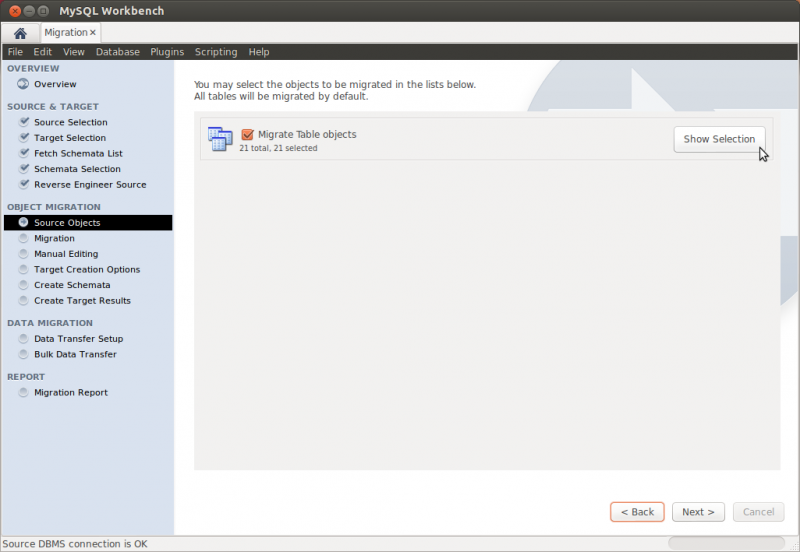 The Migration Wizard supports MySQL versions from 5.0 onwards so make sure you have a supported version. 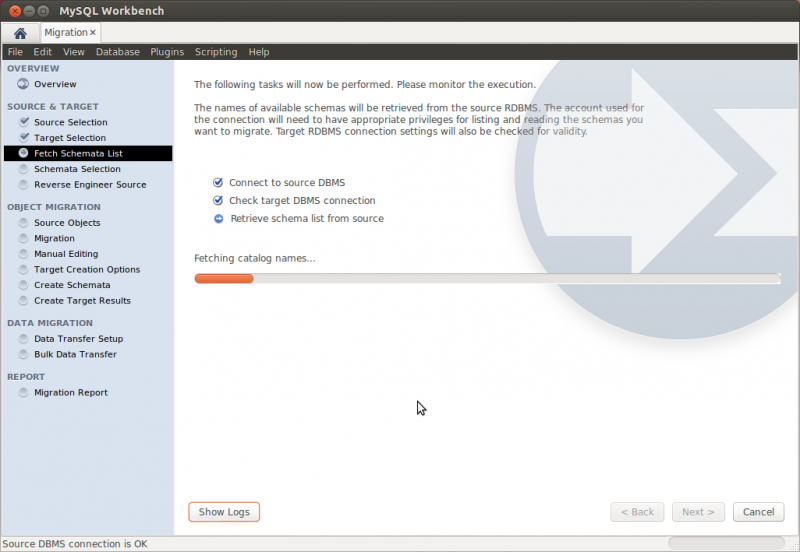 For this tutorial I’m using MySQL Server 5.5.27 CE installed in the very same Ubuntu PC where PostgreSQL is running. 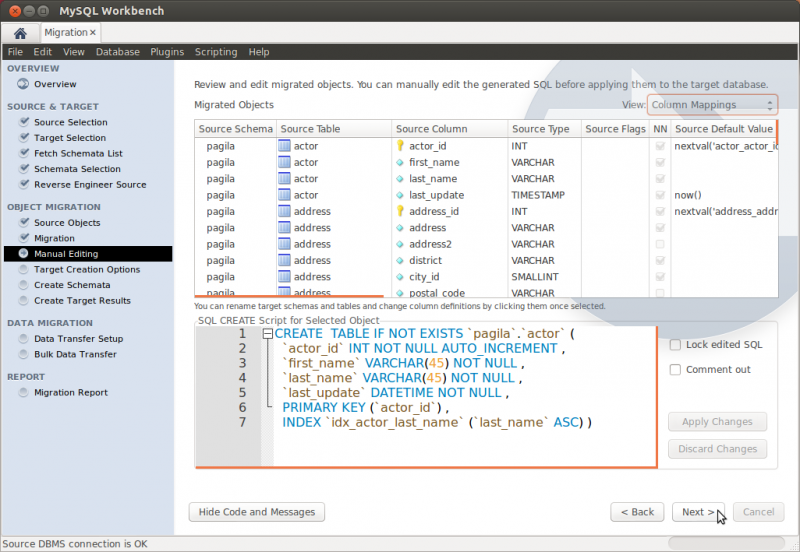 MySQL Workbench 5.2.44 or newer. 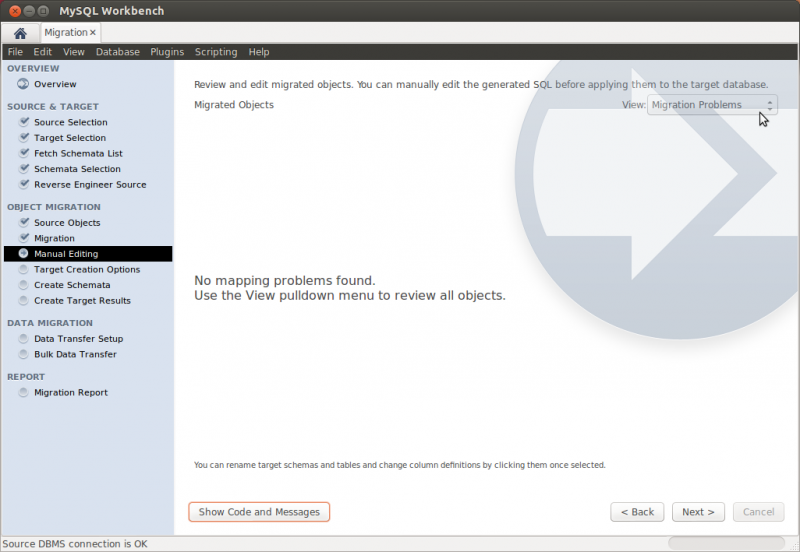 This time I’m going to use Workbench for Linux. 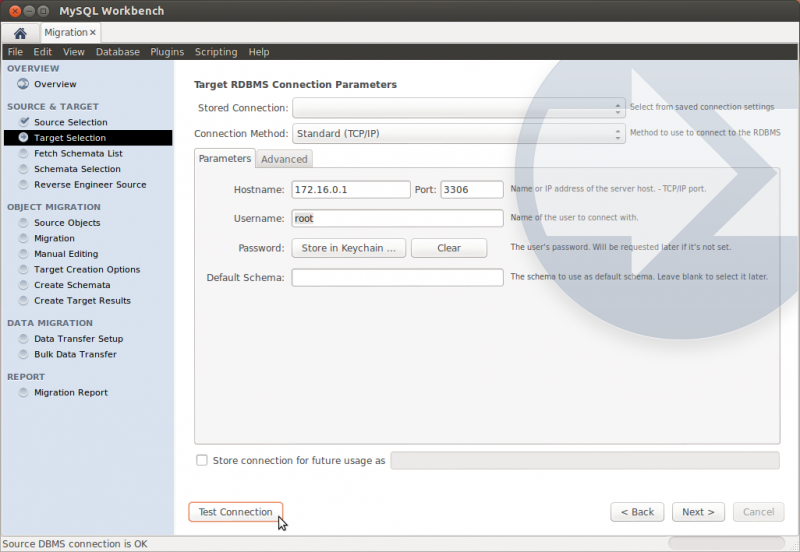 I have Workbench running in another computer with Ubuntu 12.10 installed. You need to install an ODBC driver for PostgreSQL in the machine where you installed MySQL Workbench. Please follow the instructions here. 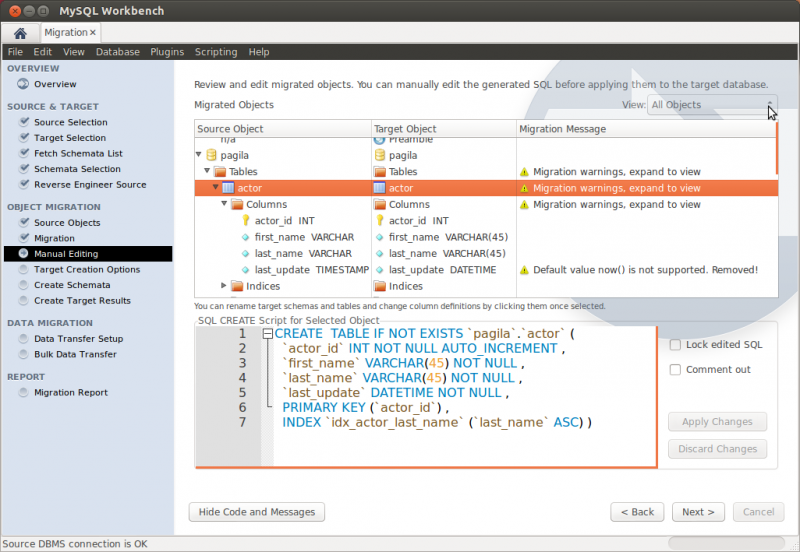 From the main MySQL Workbench screen you can start the Migration Wizard by clicking on the Database Migration launcher in the Workbench Central panel or through Database > Migrate in the main menu. Read carefully the Prerequisites section. 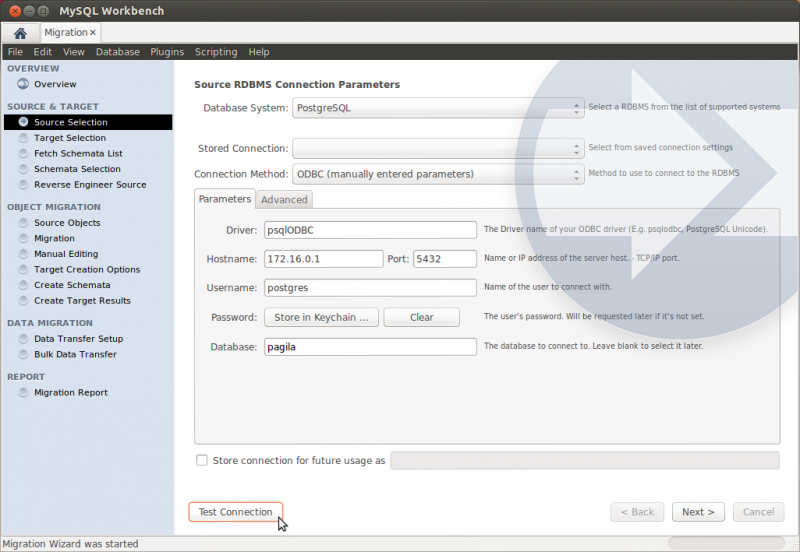 You can read there that you need an ODBC driver for your source RDBMS installed. If you have installed the psqlODBC driver as explained in the previous section, you are good to go. Click on the Start Migration button in the Overview page to advance to the Source Selection page. 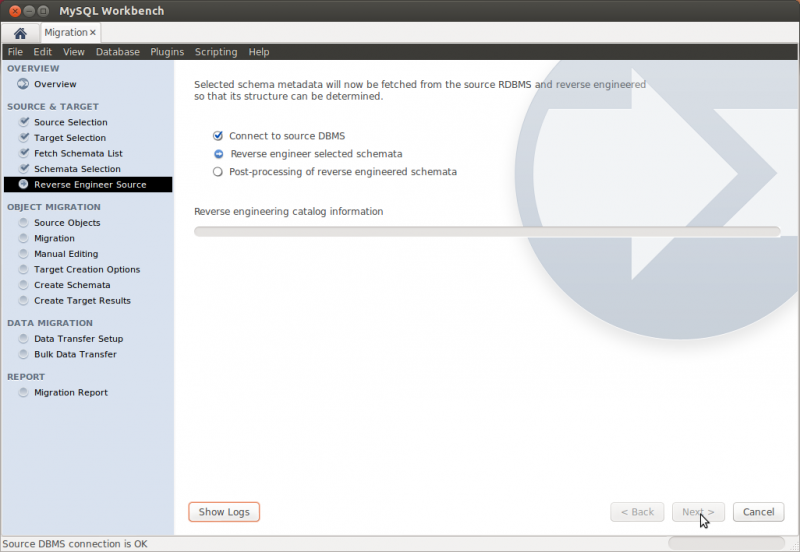 In this page you need to provide the information about the RDBMS you are migrating, the ODBC driver to use and the parameters for the connection. The name of the ODBC driver is the one you set up when you registered your psqlODBC driver with the driver manager (psqlODBC, for example). If you open the Database System combo box youll find a list of the supported RDBMSes. Select PostgreSQL from the list. Just below it theres another combo box named Stored Connection. It will list saved connection settings for that RDBMS. You can save connections by marking the checkbox at the bottom of the page and giving them a name of your preference. The next combo box is for the selection of the Connection Method . This time we are going to select ODBC (manually entered parameters) from the list since we are going to manually type the parameters for our PostgreSQL connection. Other alternatives are ODBC data sources and ODBC connection strings. Click on the Test Connection button to check the connection to your PostgreSQL instance. If you put the right parameters you should see a message reporting a successful connection attempt. Click on the Next button to move to the next page. The Migration Wizard will communicate to your PostgreSQL instance to fetch a list of the schemata in your source database. Select the Pagila sample database from the list and its default schema public. Now look at the options below. A PostgreSQL database is comprised of one catalog and one or more schemata. 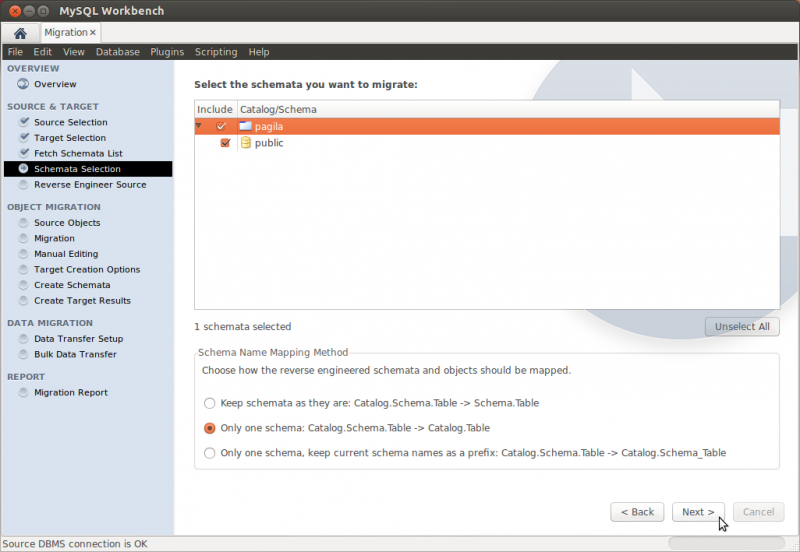 MySQL only supports one schema in each database (to be more precise, a MySQL database is a schema) so we have to tell the Migration Wizard how to handle the migration of schemata in our source database. 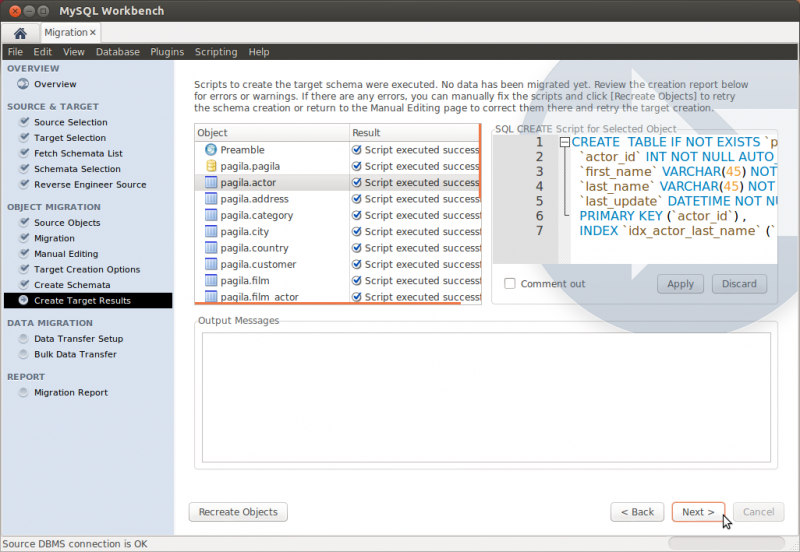 We can either keep all of the schemata as they are (the Migration Wizard will create one database per schema), or merge them into a single MySQL database. The two last options are for specifying how the merge should be done: either remove the schema names (the Migration Wizard will handle the possible name colisions thay may appear along the way) or either adding the schema name to the database object names as a prefix. Lets select the second option since we only have one schema and we are not particularly interested in keeping its meaningless public name. Move to the next page using the Next button. You should see the reverse engineering of the selected schema in progress. At this point the Migration Wizard is retrieving relevant information about the involved database objects (table names, table columns, primary and foreign keys, indices, triggers, views, etc.). You will be presented a page showing the progress as shown in the image below. The items in the list to the right are the ones to be migrated. Note how you can use the filter box to easily filter the list (wildcards are allowed there too). By using the arrow buttons you can filter out the objects that you dont want to migrate. At the end, dont forget to clear the filter text box to check the full list of the selected objects. We are going to migrate all of the table objects, so make sure that all of them are in the Objects to Migrate list and that the Migrate Table Objects checkbox is checked. 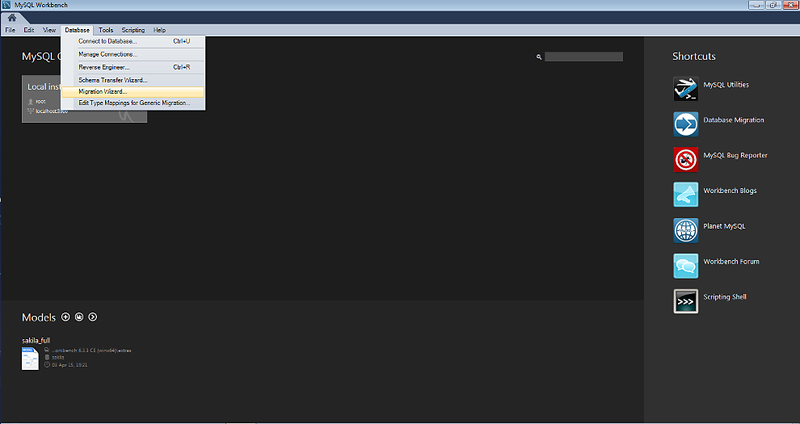 Most of the time youll want to migrate all objects in the schema anyway, so you can just click Next. As you can see in the image above there is a combo box named View . 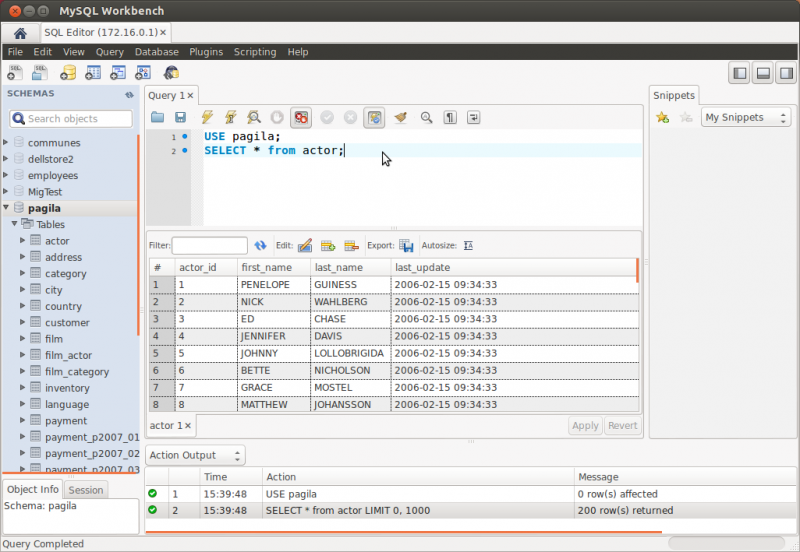 By using it you can change the way the migrated database objects are shown. Also take a look at the Show Code and Messages button. If you click on it you can see (and edit!) the generated MySQL code that corresponds to the selected object. Furthermore, you can double click in a row in the object tree and edit the name of the target object. Suppose you want your resultant database to have another name. No problem: double click on the Pagila row and rename it. An interesting option in the View combo box is the Column Mappings one. It will show you all of the table columns and will let you individually review and fix the mapping of column types, defalt values and other attributes. The next steps in the Migration Wizard are for the transference of data from the source SQL Server database into your newly created MySQL database. The Data Transfer Setup page allows you to configure this process. By now you should have a pretty good idea of the capabilities of the Migration Wizard and should be ready to use it for your own migrations. The official documentation is also there for you and you can always ask any question in the comments of this post or in the migration official forum. Live long and prosper! Could not connect to Source DBMS. 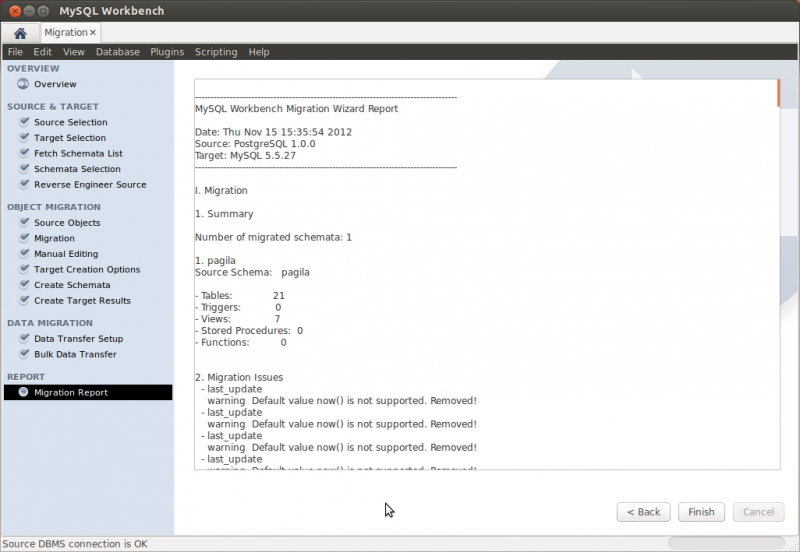 Don’t use the blog as support forum, but instead go to the MySQL Workbench/Migration forums.